World book day is upon us. We all know how important books are, reading is such a big part of my children's lives however it might surprise you to know from research conducted on 1000 parents by LeapFrog that almost half of the parents in the UK lack both confidence and the knowledge to help their children continue the reading and literacy that they learn at school at home. And it's because of this research and with LeapFrog reaching their 20th anniversary (big milestone!!) 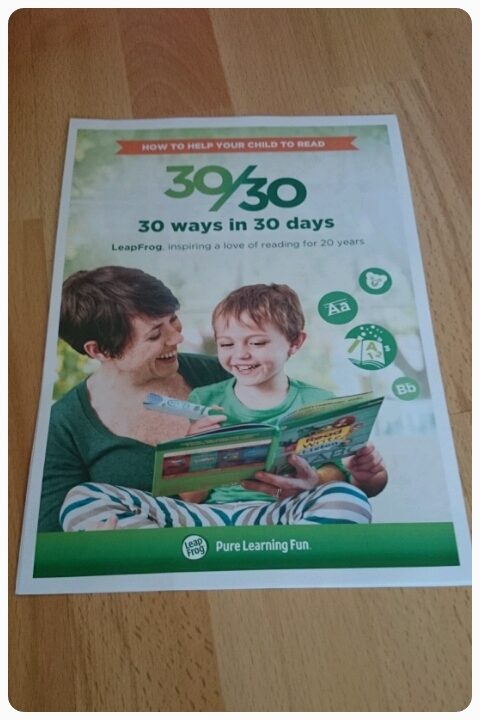 that they have created and launched a brilliant supportive booklet, the 30 ways in 30 days guide which is aimed to help parents learn ways in which to teach reading methods to their children and help instill a lifelong love of reading books!! This guide offers both solutions and tools to tackle any reading problems and aims to get reading back into the family routine, even for the busiest of families. Including tips from educational expert and of The Good School Guide , Janette Wallis. Tony Hicks, Chief International Officer at LeapFrog, comments: "LeapFrog was founded twenty years ago by a father who wanted to find a better way of teaching his son to read. Inspiring a love of reading and helping children achieve their full potential has been our passion ever since. We hope our new guide will be a great go-to resource for parents looking for different ways to help their children on their educational journey". As part of its 20th anniversary celebrations, LeapFrog has also created a series of short video testimonials for parents to view online. The testimonials hear from teachers how the LeapReader and its library have benefited children in their classrooms with reference to specific case studies. Hicks adds: "Not only will our new guide help parents reignite and inspire a love of reading at home, our teacher testimonial videos will provide them with an objective, honest view of LeapReader. We want them to have confidence in how to use the device at home, so that it really maximises their child's literacy journey." I believe that book should be a part of our childrens live from day one, I had books ready for my kids before they were even born. Reading should be enjoyable and fun, something that can be done independently or together with friends and family. Either way with the help of this guide you will see just how simple it can be to incoorperate a good book into everyday life. Such a good idea, they should put a copy in every school bag in the UK, our children are very lucky!